You can lead a student to the broccoli, but you can’t make him eat it. Or, can you? Summer is winding down and once again, schools across America are opening their doors, and their cafeterias. As school food service professionals begin the arduous process of re-opening kitchens, training staff and ordering food supplies, decisions are being finalized for breakfast and lunch menus. Calculations on nutrient content and required USDA meal components will be completed for each food item added to a meal, by the day and cumulatively for the week for multiple grade levels. It may sound like a lot of work and a bit overcomplicated, but these calculations are all part of the requirements of the National School Breakfast and Lunch Programs. Whether the lunch program director is a registered dietician utilizing nutrition software, or a head cook in a small school district working the numbers “old school” with the USDA Food Buying Guide and a calculator, these final calculations have a lot to do with what is on that lunch tray. Veggies are now grouped by color based on nutrition breakdowns, and come with a required portion size based on student grade levels and weekly required servings. Fruits, protein, grains and milk are equally addressed. School lunch nutrition has evolved into a series of calculated formulas and checkboxes. When you hear about students throwing away required vegetables, as well as other meal components, it is of no big surprise to anyone working in the school kitchen. Kids are being required to take food items they may not like, have no interest in, or even recognize on a daily basis. So, just what have school lunch programs discovered as the dust settles on the new lunch requirements? You can lead a student to the broccoli, but you definitely cannot make him eat it. Unless you educate him, that is. 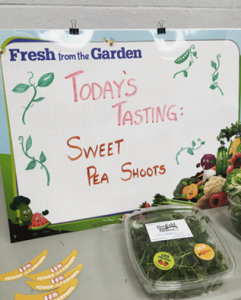 On a bright, sunny day in August, at an urban school district in Northeastern Illinois, kindergarten through fifth grade students experienced an introduction to a program that will make an impact on their lunches throughout the school year, Illinois Harvest of the Month. 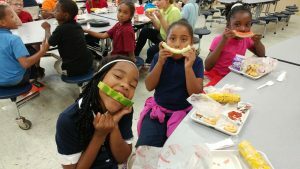 The response was overwhelmingly positive, as these students experienced local produce at the height of its season on their lunch trays. That isn’t the full story, however. The part that makes this program so successful is the food education and fun that provides students with the ability to interact and learn about their food. 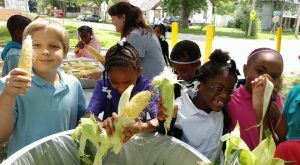 On this day at Haskell Elementary, a school in Rockford Public Schools District 205, Harvest of the Month education began as each student shucked an ear of fresh, local sweet corn on the playground during morning recess. As students furiously tore away the deep green husks and battled the fine silk guarding those sweet kernels of corn, they learned fun facts about the vegetable. They learned about where the corn was grown, and why there is so much “hair” on each cob. The students also learned that for each kernel of corn there is a matching strand of silk, and there is a correlation between the two. Students giggled and proudly displayed their cleaned ears of corn before depositing them in hotel pans for further cleaning by food service staff. More than one child asked if they could place their name on that ear of corn, they were so proud of the job they did. Their reward was the promise of grilled sweet corn, local watermelon and a “Chicago made” hot dog on their lunch tray the following day. You may be thinking this was an easy menu for kids to accept. Nevertheless, what you should take into account is that most of these kids have little experience with fresh vegetables in their raw form. They have precious little knowledge about how food is grown and limited experience in tasting fresh vegetables just one day after they are picked. Today’s students do not know that vegetables, like many foods, have a history. And, that there are uses for vegetables beyond consumption. Knowledge like this can make a difference when it comes time for that student to taste a new or unknown food. Rockford District 205 is preparing to orchestrate many lessons about locally sourced veggies throughout the school year. 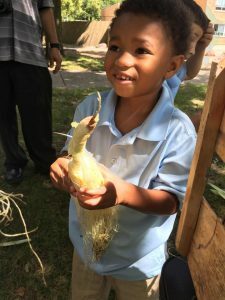 Illinois Harvest of the Month gives them the tools to incorporate local veggies into their lunch program with a side of fun and much needed education. The food service staff is excited and committed to improving the health of Rockford students through food education and new experiences with those unloved vegetables. How will they know all their efforts to improve student acceptance of required healthy veggies are working? The proof will be on the tray. Moving Farm to School Forward in Illinois. Will you tell us your story? Recently, I read an article featuring Vermont Farm to School stories shared during a statewide Farm to School Day at the Vermont State House in Montpelier. Farm to school practitioners, health advocates and schoolchildren lucky enough to have a farm to school program in their district told many moving stories to House Representatives. It got me to thinking about the power of stories told firsthand by the people who lived them. Speaking from the heart about an experience that has somehow shaped your daily life is one of the best ways to enlighten others and spread knowledge. Sharing these stories can be a powerful tool. I managed school food service programs in Wisconsin for many years and I utilized this very same opportunity to share my experiences, and the experiences of my school-age son. While working to develop farm to school policies in Wisconsin, we repeatedly testified before the Agriculture Committee and the Senate. I watched as legislators leaned forward each time my young son spoke. It was magical. Later, when I was on the road sharing farm to school programming with other organizations and schools, I often told stories of my students experiencing asparagus, spinach or radishes for the first time. I spoke about watching the change in students’ eating habits as our cafeteria and classroom lessons slowly opened their eyes to new foods. That, too, was magical. 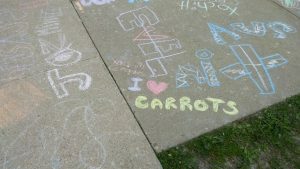 In Illinois, our farm to school stories have yet to be told. We need to change that. I’m asking Illinois schools, partner groups and organizations to stand up and be counted! Share your stories with us and let us take your experiences to Springfield and beyond. Help us spread our Illinois farm to school story, sharing our successes, and lessons learned, in all things farm to school. Let’s tell our farm to school stories from across Illinois. Share your experiences with us and watch farm to school grow in Illinois! In Search of Local Treasures: Putting our money where our values are. Over the past several weeks, we have worked on our March Farm to School Day event making decisions, setting details and hiring vendors. Planning a complex event is stressful and at times, frustrating. Creating an event that best represents our values and our work can be even more so. It is easy to lose sight of what is important as we multitask and face those event deadlines every day. Where, and with whom, we choose to spend our money speaks volumes. It speaks to who we are, what we hold dear and how deep our beliefs truly go. On the surface, it may seem trivial to be concerned about the practices of the caterer or the event planner you choose to engage. What difference could it possibly make to hire a green, or ecofriendly event planner? Or, hire a caterer who sources locally whenever possible? Well, it makes a big difference. When you are conscious of the practices behind the products and services you purchase, you are more likely to base your spending decisions on those practices. For me, this is an anchor of sorts, which holds me true to my beliefs. By making an effort to work with local businesses and artisans, or people with a talent to create or orchestrate, we bring our message to the forefront. We invest our money in our values. On March 3, we will be holding true to our beliefs. Here are a few of the companies who support our values, which we have chosen to work with. Naturally Yours Events is a Chicago-based company with strong beliefs in green planning and reducing waste. They are professionally and personally committed to minimizing the negative impact on the environment through recycling, composting, supporting local and eco-friendly businesses, using public transportation and car sharing programs, choosing sustainable food options, and using greener office/household products. The team at Naturally Yours thinks outside the box in helping to highlight your values, promote awareness and inspire others to think green. 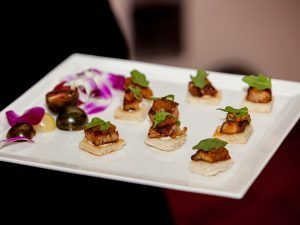 Paramount Catering and Events in Chicago creates inspiring foods, including sustainable ingredients and local products. Their menus highlight fresh, seasonal ingredients working with partner farms and farmer’s markets in our area. Did you know that Paramount servers share information relating to the origin of ingredients in their delicious appetizers? Not only is their food amazing and local, their staff is knowledgeable and connected to the foods they serve. 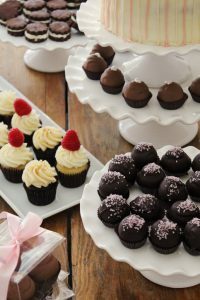 Cacao Sweets and Treats is a confectionary gem located in Grayslake. Owner and baker, Candice Hunsinger, has turned Cacao into a true community-gathering place instilling the concept of slow food as opposed to fast food, right down to the vintage chairs in the space. Cacao makes their treats with the passion and time the ingredients deserve hoping customers will slow down to grab a cup of Lake Forest-roasted Reprise coffee (served in a handmade mug) and enjoy a cookie or biscuit. For information on the IL Farm to School Day Farmhouse Fete on March 3, click here.